Meet your neighbor Kristin Palmer born in Macomb, the daughter of Bob and Pat Boyer of Blandinsville. She has on brother, Scott, and a nephew, Devon, who she loves spending time with and going to watch him play ball. Kristin graduated from Northwestern HS in 1993 and WIU in 2003. She is currently the 5th grade teacher at La Harpe School but has also taught 2nd and 3rd grade as well. 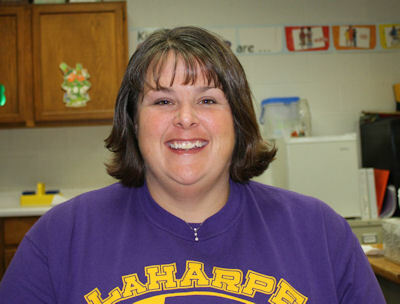 She enjoys teaching in the La Harpe school district and watching her 5th graders play ball. Kristin married Jasper Palmer in 2008 and was blessed with one step-daughter and 3 nephews. Her favorite memory is when Jasper proposed and their wedding but also the birth of her nephew Devon. She loves riding motorcycles with her husband and being involved in memorial rides for our fallen hero's. Kristin also enjoys spending time with her family and friends.